Hey there, Amy here. I thought I'd start off the holidays with a beading-book review (I am the official Pimp Stitch beading expert, after all). Not only does this book have some terrific gift ideas in it, but it would also make a great gift for your favorite crafty teen. Read on! I was excited to see that this was not just so ho-hum beading book. Had I seen this book on the shelves, I would have purchased it for the inspiration factor alone. As you can see, the charm bracelet on the cover is colorful and fun - and just a small example of the goodness you will find inside. I love the jewelry in this book because it is simple and fun with a hip flair. The directions are clear and concise and the layout is definitely reminiscent of BeadStyle magazine so if you are a fan of the magazine than you will be a fan of this book. As an advanced beader, I know most of the techniques in this book, but there are a few tips, tricks, and techniques that even I didn't know. That makes it a great book for beginning and advanced beaders, alike. One of my favorite projects are the beaded snowflakes. They are easy to make and look beautiful on your tree - plus they make great Christmas gifts. My second favorite project is how to make your own hoop earrings. I love this tutorial because it shows you how to make your own earring findings as well, which is cool because I find it's difficult to find unique findings in bead and craft stores. There's plenty more cool projects in this book, and as I mentioned before, it's worth the money for the inspiration alone! We're taking this week off from tutorials, but we thought we point you towards some great ones on the blogs. We found this one via Whip-Up. I know, last week it was dogs. In order to be fair, this week it's cats. I love 'em both. A long time ago when I started making things for Etsy, I designed these sushi catnip sets. They're fun. They're frisky. They're laced with drool-inducing catnip. Don't forget to make the dollop of wasabi, too. Cats are picky like that. Don't worry about the chopsticks. They don't have thumbs. Happy Thursday! Hey guys & gals, it's Amy here with your book review. I'm a day late and a dollar short but that's how it goes this time of year, isn't it? How does another general crafting book tickle your fancy? 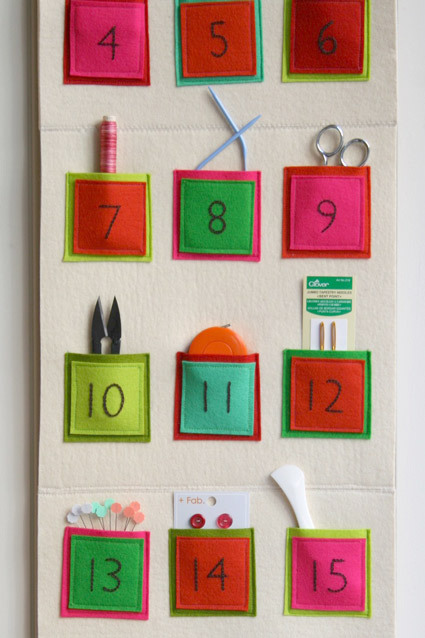 This one is full of nifty, thrifty, and kitschy goodness! If you like Craftster.org (and who doesn't?) 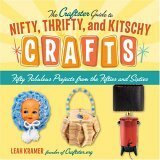 then you'll LOVE Leah Kramer's book, The Craftster Guide to Nifty, Thrifty, and Kitschy Crafts: Fifty Fabulous Projects from the Fifties and Sixties. Leah Kramer is also the mastermind behind Crafster.org, hence the comparison. This is a terrific book for all levels of crafters, although it especially appeals to those of us who love all things kitschy and retro. Some of my favorite projects from this book are the cigar box and book clutch purses, card suit throw pillows, and the tote bag apron. The book also includes instructions for classic projects like record bowls, etched glassware, and DIY snow globes. Some of the projects are just down-right silly (but still fun), like the toothbrush bracelets, foil animals, and "merry" monsters. Near the end of the book you'll find instructions for Christmas ornaments that look oddly familiar. Perhaps I've seen the bits and leftover pieces of such ornaments in my grandmother's house. No matter, now that I have Leah's book, I can finally make my own! We know you're frantically crafting for all your Holiday gift-giving (or you're like me and haven't started yet)--so here's a sweet little squeaker who would love to be hanging around on your tree! And if you leave off the ribbon loop and mix some catnip into your stuffing, I'm sure there would be a few felines (naughty or nice) who would love to have a new friend. Now your mouse is ready for ears. I like to pinch them in half and sew them with a few stitches at the end to form them before I stitch them on the body. Stitch them to the body, on either side of the loop. Sew on bell to tip of nose. Using three strands of embroidery thread, sew eyes (either straight stitches or french knots will do) and a little mouth (like an upside-down "Y") if you like. This pattern makes a lean little mouse about 5" tall. For a more petite rodent, shorten the body portion of the pattern and make the base circle smaller, as well. You could make a whole family! Eek! Us gals over here at Pimp Stitch are kinda nutty about our critters. We all have pets--and all of us except one have a dog (or, ahem, two..in my case). I came across some super cute pet crafts a while back and thought I pull 'em out for you. Because even doggies like having a little something under the tree! And to go with that leash, you might want to make a coordinating jacket vest. You can find an adjustable pattern for that here. I found the photo gallery of completed ensembles quite entertaining. Going for a more Chippendales-ish look? These canine collarettes might suit you. I personally like the one with the leather fringe. After you get your doggy all dressed up, you might need something to reward them for putting up with us insufferable humans. Preheat oven to 325 degrees. Dissolve yeast in water. Add egg, broth, honey, garlic powder. Gradually add in the dry ingredients until dough is stiff and firm. Put on floured board and knead until smooth. Roll out until 1/4" thick and using doggie bone cookie cutter, cut out treats. Space about 1/4" apart on cookie sheet and bake for 45 minutes. Let cool overnight and then place in airtight tin or freeze.